Source San Antonio Express News. Ninfa’s is a popular chain of Mexican restaurants located in Texas. Ninfa's is really only left in one location in Houston. 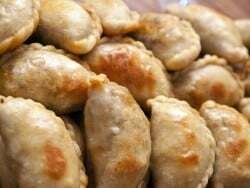 This Empanada recipe was published a long time ago in the Houston Chronicle. To make dough: Dough can be made by hand or in a food processor. To make by hand, measure flour and sugar into a bowl; stir to mix. Add fat and thoroughly work it into the flour. Dissolve salt in water (mix with egg yolk, if using), and add to flour mixture; mix to form a medium-stiff dough. Knead for 4 to 5 minutes. If using a processor, add flour and sugar to work bowl; pulse briefly. Add fat, then process until it's thoroughly incorporated into the flour. Dissolve salt in water (mix in egg yolk, if using), and then add through feed tube with machine running. When the dough has formed a ball, continue to process to knead dough for 20 seconds. Remove from bowl and knead into a smooth ball. Divide dough into about 8 to 10 equal parts, roll into balls, cover with plastic wrap and let sit for about 20 to 30 minutes to make the dough easier to roll. For each empanada, roll a ball of dough into a flat round, tortilla- shape, about 8 inches in diameter. (Use a tortilla press, if available.) Place on a hot pan and cook briefly on one side. In the center of the tortilla, with the cooked side to the inside, put bananas, raisins, pecans, and honey. With a small pastry brush, brush egg white around the edges and fold it over to form a half-moon shape. Using a fork, press around the edges to seal. Pour oil to a depth of 1 1/2 inches into a wide frying pan and heat oil to 350 degrees. Fry empanadas for 2 minutes, turning as necessary, until golden brown. Remove from oil and let drain. Sprinkle powdered sugar over top, then cinnamon. Garnish with banana slices, pecans, and raisins. Serve with a scoop of vanilla ice cream on the side, top with the cherry and accompany with a pitcher of warm cajeta sauce. I’ve had these at Nifa’s and loved them. I will be making these at home! Maybe minus the raisins.